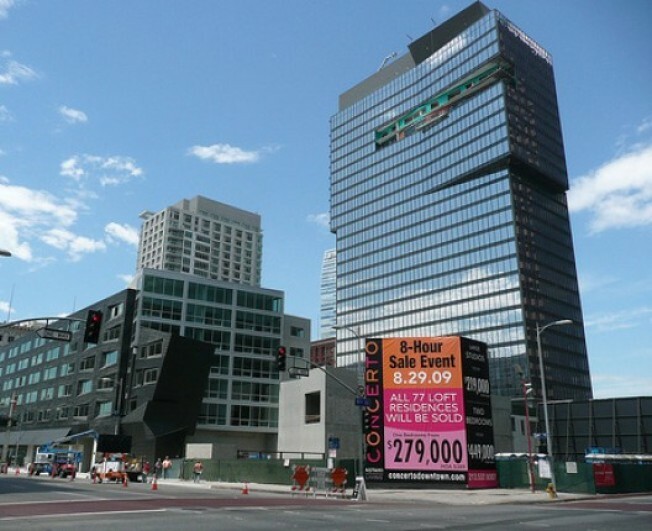 Developer Sonny Astani's Concerto project is now boasting very large and very colorful signage for his forthcoming August 29th sale at the downtown development. Back in April, we toured the building, but were asked to hold off on taking any interior photos of either the loft portion or the tower. With the loft portion (the smaller, dark-colored building) nearly done, here are a couple of interior photos, courtesy of Astani Enterprises, as well as a mix of our own photos of the 77-unit loft building on Flower Street (the 271-unit tower at Fig and 9th streets will be done later this year). As announced last week, the sale will see prices drop rather significantly: Prices are now shy of $300 a square foot. It'll be interesting to see how buyers react to the lofts. When we toured the units, we liked the scale of the loft building, and appreciated the look of the proposed pedestrian improvements (a paseo connecting Flower and Fig is planned). On the other hand, some people prefer shacking up in shiny, tall towers.